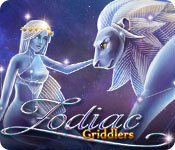 Welcome to Zodiac Griddlers! It’s about time the universe unravels some of its mysteries to those who are eager to learn. Is there really a connection between the movement of the planets and our lives? How does the cosmos affect us? 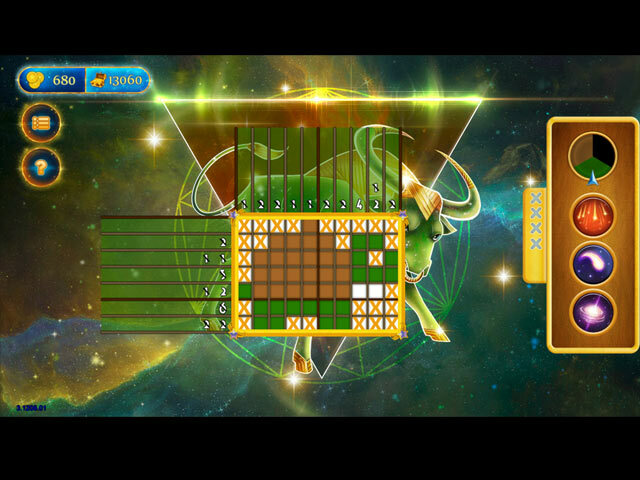 This game has some of the answers, as well as 120 exciting griddlers, 12 beautiful locations dedicated to zodiac signs, completely otherworldly music that will take you away from all your troubles here on Earth, and other pleasant surprises. So tell me... What’s your sign? Zodiac Griddlers is rated 3.5 out of 5 by 6. Rated 5 out of 5 by verimeri from should get better reviews I enjoyed this game a lot. I think it should have gotten better reviews. Yes, you may have to use a power up now and then but I am on level 40 and have only needed one. You do have to switch between colors often to get that one space that allows you to get one space in another color but isn't that what griddlers is all about? Rated 4 out of 5 by sjrkeskusay from gorgeous graphics, less than perfect game play The developers let the art department out to play here. This game might be in my top 5 for the attractiveness of the story artwork. The narrative is also very nice, if typical for an astrologically themed game, as is the new-age music. The game grid continues the design beauty, with an animated interface, wider grid lines, and a wide range of colors. Unfortunately this is also somewhat problematic. Lovely to look at, but not as clear as most of this genre for those with less than perfect vision. Also, a pet peeve here, there were several instances where guessing was necessary even in the early game levels. Although it could be viewed as an additional kind of game to try to determine where to place a tile based on the picture, I think griddlers should always be solvable through logic alone. This review is based on working through 3+ of the 12 astrological signs during the 1 hr trial period. Rated 4 out of 5 by CyndiLouWho2 from Takes a bit to get used to but it's fun! The main reason I enjoyed this game is that you don't get penalized for using hints, like you do in those silly penguin mosaic games. I never could understand why they give you hints to use but deduct stars for using them. That still makes no sense to me. Anyway, the mechanics of this game are a little tricky at first, but once you understand how they work, the game is fun. Grids are a nice mix of easy and hard. You'll have a few large, difficult boards and then an easy one will be thrown in. I liked that feature. There really are no story lines in these types of games so enough said about that. Zodiac Griddlers IS based on logic. But as far as 'guessing', I never 'guessed' at anything. I simply used a hint for help, because this game allows you to do so. It PREVENTS you from guessing and making a mistake, because making errors will go against your score. All in all, after you get used to how the game works, you'll enjoy this one. Rated 3 out of 5 by CastellanosML from Not a Bad Game But Issues on Certain Levels Most of the game is okay -- it is a standard griddler game. But, on certain levels they have positioned the menu and options button on top of the numbers required to solve the puzzle and you have to guess at what the numbers are. A little more thought needs to be put into the placement of elements. Rated 3 out of 5 by TucsonGal72 from Duplicate pictures I purchased World Carnival Griddlers some time back. There are pictures that are almost the same, just different colors. Very disappointing to be getting the same graphics with the colors changed. In particular the carousel with the horses and tent are almost identical. Rated 2 out of 5 by pennmom36 from AND YET ANOTHER GUESSER GRIDDLER COMES OUR WAY How many of these games have they made? How long will it take before they "get it" that Griddlers are puzzles you solve using LOGIC not fancy named power-ups or by GUESSING!!?! 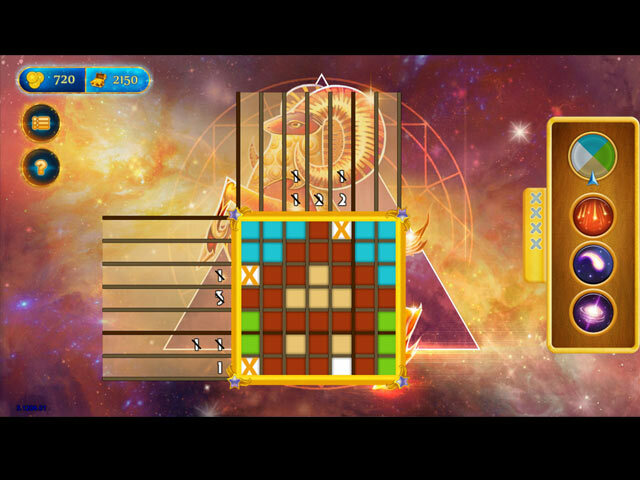 Once again the game starts out with tutorial pages explaining the features, and the first explanation states, "To solve a griddler, you must guess and fill in the colored squares" That is NOT how it works! To solve a griddler, you're supposed to use logic and NEVER guess at filling in the colored squares!!!!! But these guys throw in several super simple Griddlers, followed by one that forces you to guess or use a power-up. The grids are super basic, and super easy. The filled in cells have a border around all 4 sides which give them a flat appearance. When you hover the cursor over a cell with the intention of crossing it off (right clicking to fill cell with an X) the cell automatically shades the cell with the color it would be when filled in, which is confusing, and some of the colors are similar hues, which can be confusing at times, when you can't tell where one color starts and the other ends. 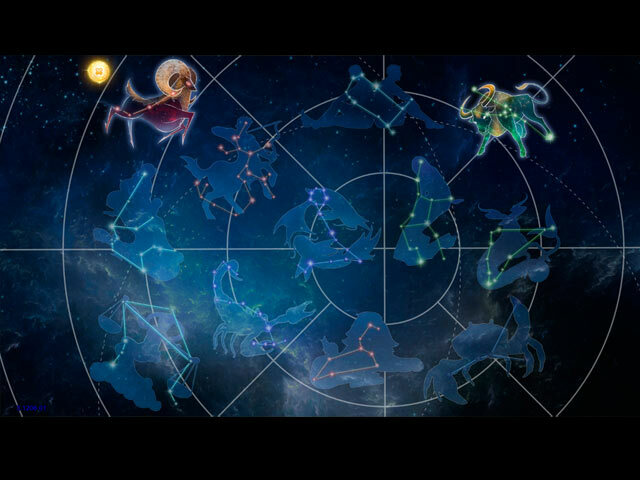 There are 12 Zodiac Achievements, mostly for finishing a certain amount of levels, and they tell you about each of the Zodiac signs, info on the constellation and kind of a horoscope. There are 3 different Power-ups available, which can be upgraded with the coins you earn solving guessers griddlers. SUPER NOVA: Fills in a Random cell, upgrade fills in 2 Random cells. SHOOTING STAR: Fills in 1 chosen cell, upgrade 2 Random cells. BIG BANG: Fills in a 5 cell area, upgrade fills a 9 cell area. You can also purchase the right to make 4 or 5 mistakes, because this griddler is based upon guessing! This is a horrible griddler with pictures that make no sense. An Apple? A Duck?? Really? The are far better griddler games available that are based upon logic. Do yourself a favor and pass on this one!